Well, it happened. All celebrity partnerships are indeed legendary, but nothing EVER will top this. 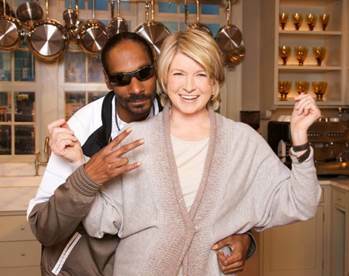 Snoop Dogg (formally known as Snoop Lion) and Martha Stewart (formerly known as inmate #55170-054) are going to star in a new cooking show, CNN reports. Mind. Blown. If you’ve seen Snoop Dogg narrate Plizzanet Earth and Martha Stewart roast Justin Bieber (which I hope you have), you can already tell this celebrity collaboration is going to be epic. You get cooking and comedy in one – what could be better? The stars will co-host “Martha and Snoop’s Dinner Party” on VH1, coming this fall. The show will feature the duo preparing meals for various celebrity friends. And you know Snoop and Martha will have the BEST combination of celebrity friends. Snoop told VH1, “My homegirl Martha and I have a special bond that goes back. We’re gonna be cooking, drinking, and having a good time with our exclusive friends. Can’t wait for you to see how we roll together!” Yes Snoop. I cannot wait to see how you roll together. Martha reflected his sentiments, “Our new show is rizzle, dizzle for shizzle.” Wow. Everything in my life is coming together at this point. Out of all the unlikely friendships in the world this one is, without a doubt, my favorite. Could it be because even with all this hilarity there is still the added bonus of learning delicious recipes? Yes. Could it be because I will be learning these recipes from a probable drunk and/or high Martha Stewart and Snoop Dogg? Also yes. Culinary and cannabis… what a combination. Check out the brilliance below from when Snoop appeared on Martha’s show in 2008 for a quick taste of what we can expect.